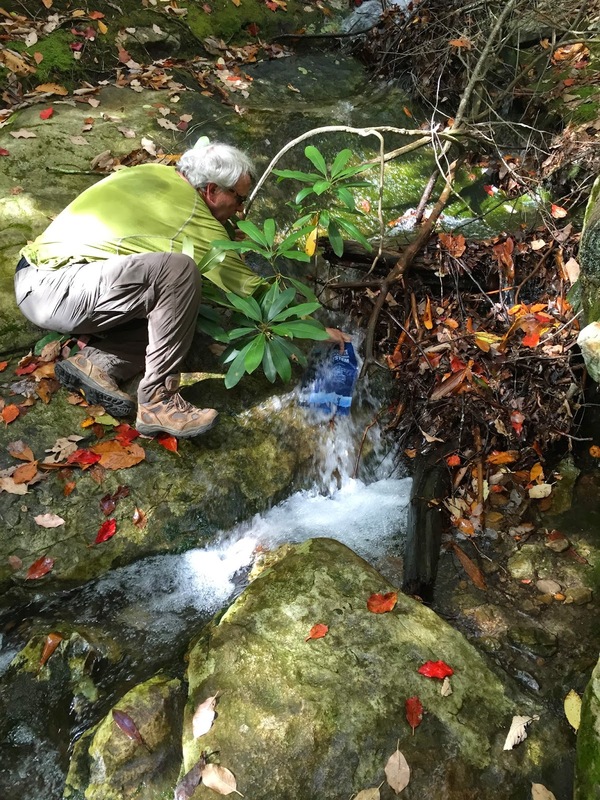 This posting describes Day Two of a three day backpacking trip over Burkes Garden in Southwest Virginia, northbound on the Appalachian Trail. I posted a report on the first day of this trip a while back, (link), and am just getting to the second day now. This was the longest day of the three, but without the climb that we experienced in Day One. This is because we were already at the high point of the trip where we slept. If we moved even 20 feet in any direction from our shelter, we were not at the same elevation. Climbing from the bottom bunk to the top bunk added 5 feet to our highest point. Beartown Wilderness sign next to our shelter. No trails into the wilderness, just this sign. Outside the Chestnut Knob Shelter overnight was windy and cold, but we were protected from all of that as we were in one of the rare 4 walled shelters on the A.T. We closed the door and kept all of the weather problems outside. This is a really nice shelter - made all the nicer by having it to ourselves - and we recommended an overnight there to all of the southbound section hikers we met over the rest of our trip. None of them planned to stay there, however, as all were planning to continue on to the Knot Maul Shelter – a standard shelter indistinguishable from a hundred other A.T. shelters. Why stay in a Motel 6 when you can stay at the Ritz? Timetables rule most hikers on the trail. 7:41 AM photo of Burkes Garden from Chestnut Knob Shelter. 8:58 AM photo of Burkes Garden from Chestnut Knob Shelter. The Chestnut Knob Shelter is on the edge of an open field, with the woods just to the north and east of the shelter. Sunrise over Burke's Garden was spectacular! I took multiple photos that did not do justice to the view. After taking several early dawn photos down into the valley, we packed up and moved north on the A.T. For the first 1.4 miles, we dropped quickly in elevation, going from 4417 to 3506 feet, according to my GPS. After that, we generally climbed for the next 1.2 miles before hiking at a pretty steady elevation for 5.75 miles, along the crest of Garden Mountain – never going much more than 100 feet in elevation on either side of 4000 feet. There were actually relatively few views into Burke’s Garden during the hike, though the views we did have were absolutely the highlight of these three days. Burke’s Garden is one of those Virginia places I had never visited but had been on the list almost since I moved here 22 years ago. Legend has it that Cornelius Vanderbilt wanted to build his mansion here instead of Asheville, but the folks owning the land refused to sell. Burke’s Garden is completely surrounded by mountains, and referred to in travel materials as “God’s Thumbprint” because of how it looks from the air. Geology explains how it came to be – softer limestone eroded away over the eons, leaving the sandstone layers as high mountains and creating very fertile farmland in the valley. There isn’t much other than farming that goes on here – no businesses other than a store (and farms) in the valley, and no overnight accommodations to be found. Only one paved road into the valley, with a dirt road requiring many switchbacks on the opposite side of the oval heading out. The seclusion contributes to the unique nature of this hike. Burkes Garden from the air. The A.T. follows the ridge on the left in the photo. We crossed a couple of dirt roads with parking areas along the ridge, but I have heard that both of these roads are really difficult to get to and pretty rough on the car, even though they have parking areas where the trail crosses. Keep an eye out near these crossings for rocks providing views into the valley – they aren’t always obvious, but are worth the effort to find. View from one of the few overlooks. This one at N37° 04.567' W81° 18.593'. My hiking partner Pete, in a panorama from one of the viewpoints. Before the second road crossing we had been hiking on the edge of the Garden Mountain Wilderness (Map), while on the ridgetop. 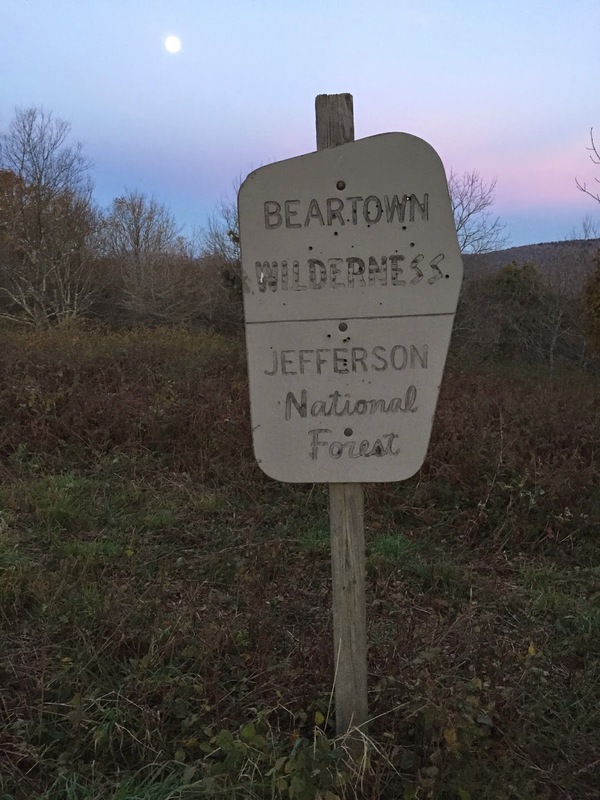 This area was designated federal wilderness only in 2009, making it one of the newest wilderness areas in the state - it did not even have a sign. The A.T. is inside and along the wilderness's northern boundary for 2.5 miles. We crossed the 2nd dirt road, called Sharon Springs Road (Rt 623), and entered into a second Wilderness area. 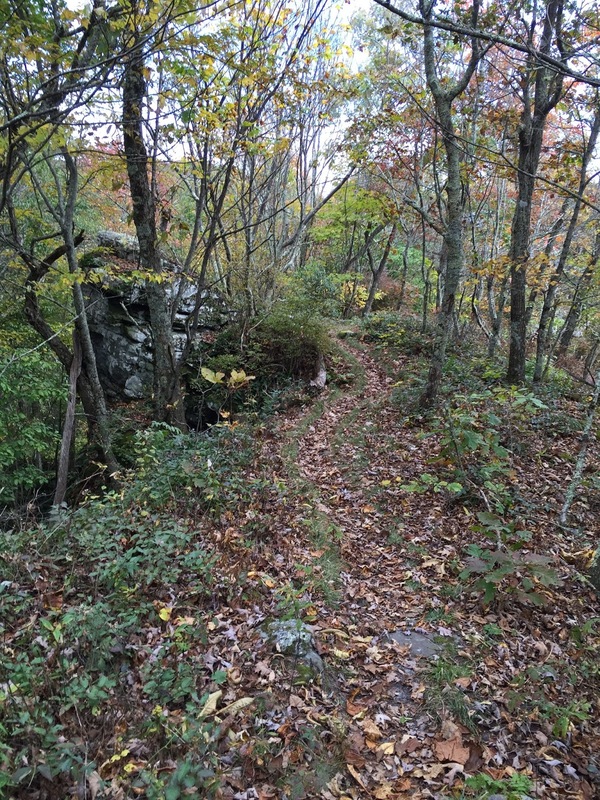 This is the Hunting Camp Creek Wilderness. This one actually had a sign, on the north end of the Appalachian Trail, so we passed it when leaving the wilderness. 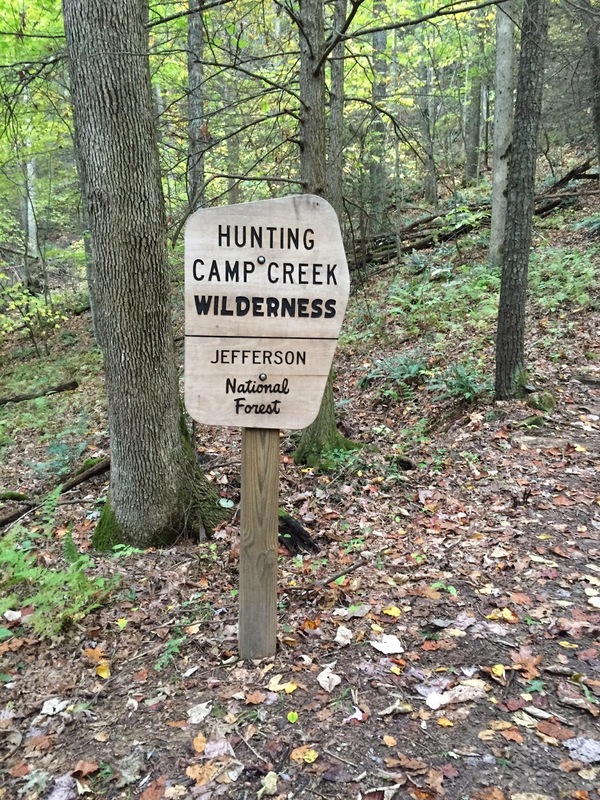 Hunting Camp Creek Wilderness is also over twice the size of the Garden Mountain Wilderness, and the A.T. continues for about 7.5 miles through this wilderness - until the next road crossing. The two wilderness areas would be a single area except for Sharon Springs Road - no roads allowed in the wilderness. The sign still looks brand new. Pete refills before we continue to the Jenkins Shelter. At 11.8 miles we reached the the Jenkins Shelter, which is just off of the A.T. It was a pretty standard shelter, with a couple of southbounders settling in for the night. Even though it was only about 3:30 PM when we visited, this made sense because it had taken us nearly 8 hours to get from the next shelter, and we were going downhill. We stayed here for a few minutes talking to the other hikers, and I changed my GPS batteries but forgot to turn the unit back on, losing about 0.8 miles of data. Leaving the Jenkins Shelter, we crossed Hunting Camp Creek and started climbing again. Jenkins Shelter was at about 2500 feet (down from 4400 feet at the start of the day), and we climbed to 3150 feet over the next 1.5 miles. At the 13.4 mile mark on the day, a trail called the Low Water Trail splits off from the A.T. There is no sign here, but this was the A.T. alignment until relatively recently. Apparently the Low Water Trail had high water too often when it was the A.T., so the former High Water Trail is now the A.T. alignment. The hiking was very easy and fast through this section, as we were on an old woods road that was very level. It was great to be on this section even though we were tired from a long day. For 2.2 miles, the trail did not deviate more than 100 feet in elevation and we made good time in the waning daylight. At 15.6 miles, a blue blazed trail heads off to the left. This is described in my A.T. Guidebook as the A.T. route – I think this is because a bridge had to be rebuilt down trail. Before the rebuild, the trail to the left took the hiker to the next road, and there was a mile road walk. Now there is a nice bridge crossing Laurel Creek. I did not see the Low Water Trail again meet up with the current A.T. - it was somewhere around this bridge. New bridge crossing Laurel Creek. For the day we hiked 16.7 miles in just over 10 hours. Total ascent was 3100 feet, and descent was 4792 feet. We stopped hiking just before 6 PM, which gave us enough daylight to set up camp and cook dinner before darkness set in. It comes early in this area, as we were in a valley between several mountains. It had been a long day, so I slept well! Laurel Creek from the A.T. bridge. 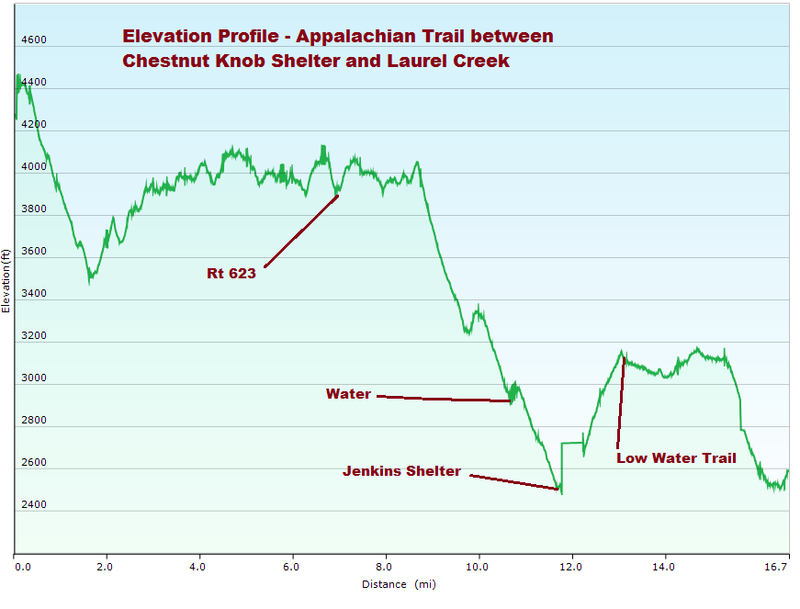 Here is a link to a topo map showing the day's route: Link. Total Time: 10 hours, 10 minutes, including stops.